One of Hollywood's most unique churches, the Country Church of Hollywood, and is beginning shortly after Dr. William Hogan, and his wife Virginia, and their five children arrived in Los Angeles in 1932. The website hollywoodphotographs.com has the largest collection of the Counrty Church of Hollywood. Dr. Hoag had been a Methodist Church circuit preacher in the Cumberland Mountains of Tennessee prior to World War I and later became a well-known evangelists in the south. Shortly after arriving in Los Angeles he approached radio station KFAC with the idea of broadcasting a 30 minute program each day, which, first for the first 10 minutes, he portray a country preacher visiting rural families in fictitious “goose Creek”. the first broadcast of the country Church of Hollywood took place on Monday January 2, 1933. Rather than use his name in the broadcast, Dr. Hogan use the name Parson Josiah Hopkins. From that time on, Dr. Holt was known by his pseudonym and to many listeners, his real name was never known. His wife Virginia, who later joined him in the broadcast, was known as sister Sarah. A few days later, Josiah came home with two letters from listeners who had heard the morning meeting. The next morning there were eight letters in the mail. By the end of the second week, several letters were being received daily, there by convincing the radio station personnel that the program was catching on. With his popularity increasing, Parson Josiah Hopkins held his first religious gathering in Hollywood on August 22, 1933 at Hollywood Boulevard and Bronson Avenue. After a while Josiah began looking for a location to build his country church in Hollywood. At first he thought the place for it was where he had held his first gathering and it nearly broke his heart when the man who owned the property said he would release it. But, right in the heart of Hollywood, at the corner of Argyll and Yucca Street, in the midst of a grove of beautiful trees, stir up what was left of the old A.G. Bartlett mansion. After negotiating with the owners, Josiah released the 2 acre parcel which he later named goose Creek. 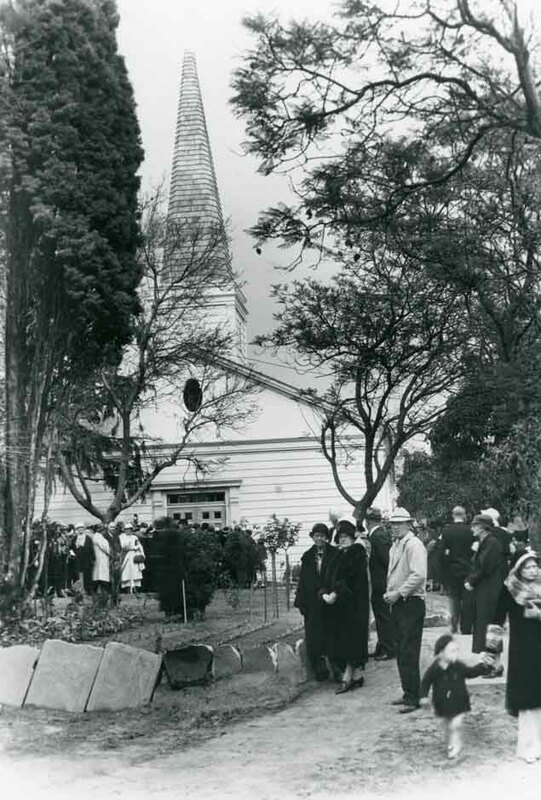 On December 31, 1933, erected a large tent on the north lot for preaching services, and on February 25, 1934, ground was broken on the lower law for the church building. All of the work, except for the architects drawings and construction supervision, was done by volunteers. After an incredibly short construction On seven weeks, the country Church of Hollywood was officially dedicated. The nondenominational, nonsectarian services were continued in the large tent while the church was used for weddings and the daily radio broadcast which, by this time, and become the most popular morning program on radio. Parson Josiah Hopkins health began to show the results of working too hard as if he knew his days were numbered, Josiah Hill is less service in the church building rather than in the tent. On January 14, 1937, less than two weeks after his last sermon, arson Josiah Hopkins passed away. Josiah's wife, Virginia took over the reins of both the church and the radio broadcast and during her leadership, the churches nor lot was relinquished to its owner and the lower lot purchased outright. The radio broadcast continued until 1965 just a few months before sister Sarah joined her husband Josiah. Josiah's daughter Martha Hoag took over the reins of the church. The church's last service was held in 1997, after which it sat empty until Christmas Eve 2007 when it burned down – – apparently due to malicious arson. In addition to Country Church of Hollywood photos, there are thousands of photographs of Hollywood Blvd., Hollywood Sign, Ciro's nightclub and the Hollywood Canteen. Some of the rarest photos of the country Church of Hollywood are on the hollywoodphotographs.com website. All the photographs are available for purchase.